One of the things that I have on my list of 50 things to do in this year to celebrate turning 50 is eat five new items. Only when I wrote that down did I realise that we often eat the “same” thing over and over again. When we order food, its the same things every time … rarely does it change. We do eat a variety of food at home, but its food items that have been made again and again over the years. When Ashwin was here, we took him to eat the famous Sita Ram Diwan Chand Chole Bhature at Paharganj along with Chavi. The Chola Bhatura was everything that one wanted and not as heavy on the stomach as one would have thought. I still liked the “Chache di hatti” Chola Bhatura that we had in Kamala Nagar with Hareesh (Ashwin’s dad) more, but again, I ate Kulcha Chola not Bhatura there, so its not a fair comparison. As we stepped out of the restaurant to go towards our next stop “Keventers” at C.P, we found this push cart guy selling “Daulat Ki Chaat”. I have seen this being sold in Paranthe wali gali, Old Delhi but had never tasted it. I wouldn’t have tasted it here too, but for Chavi asking if we would want to eat it. Ashwin and I immediately said “yes”. Krishnan didn’t taste it because he wanted to focus on the Keventers milk :). “Creamy, thick milk is churned, and the froth that forms is kept in a bowl. On this some foams of saffron-infused milk are added for light colouring and flavour. Before serving, a pinch of powdered sugar is added to it. Some of the other things that I noticed with this particular push cart vendor – his cart was spotlessly clean and he had a garbage bag below to throw the used cups in. An aware citizen. When we asked him for directions, he was precise and gave us suggestions on how to reach the next location. 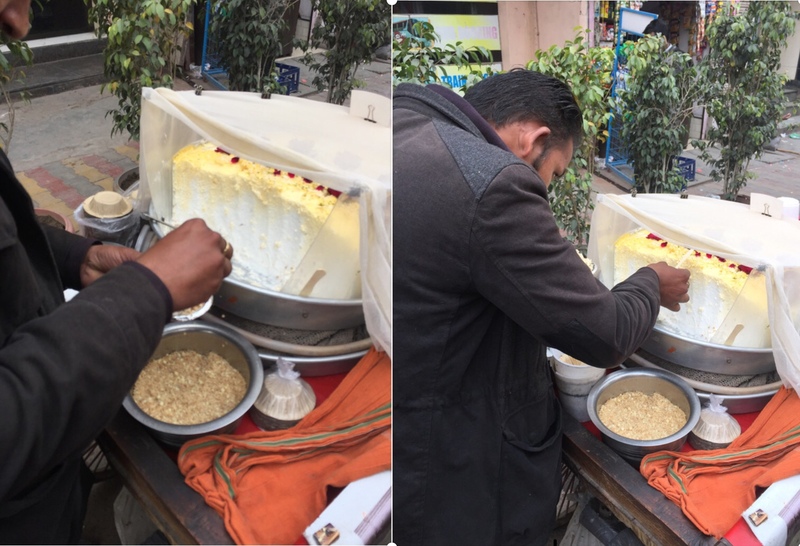 Loved the Daulat Ki Chaat and can totally understand why it was named so – it is ephemeral like wealth !